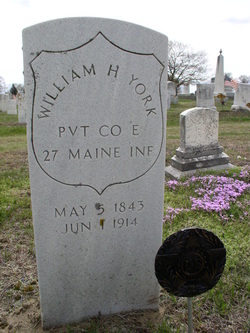 WILLIAM HARRISON YORK was born on 5 May 1843 in Wells, Maine, the son of Josiah and Catherine (Davis) York [ME Death Rec]. He died on 1 June 1914 in Wells, aged 71 yrs, 27 das, from cancer, and was buried in Ocean View Cemetery in Wells [ME Death Rec]. On 10 Mar 1867 [Wells VR pg 468], he married SARAH A LITTLEFIELD. She was born 19 Apr 1849 in Wells, the daughter of William and Harriet (Stewart) Littlefield. She died on 9 Mar 1910, aged 60 yrs, 10 mos, 11 das, and was buried in Ocean View Cemetery [ME VR]. William was a life-long resident of Wells, where he was seen in records as a laborer, stone mason, and farmer [1870-1910 censuses]. The 1900 census shows wife Sarah having had six children, only two still living. I. HOWARD YORK, born 27 May 1867 [Wells VR pg 459]. He died on 30 July 1914 in Wells from cancer at age 47 and was buried in Wells [ME VR]. His wife was ETTA BRIDGES, the daughter of Joseph and Almira (Hilton) Bridges, whom he married in Somersworth, NH on 1 Mar 1889 [NH marr rec]. She was born in Wells on 14 Sept 1867 [Wells VR pg 450], and died in Kennebunk on 21 Jan 1904 [ME VR]. He remarried 13 July 1914 in Wells [Wells VR pg 584] to ESTELLA BRIDGES, Etta's sister. After Howard's death, she would remarry to Raymond G Newhall. 1. Irving John York, b. 22 Dec 1891 in Wells Beach [WWI, WWII Draft Reg Cards]. He married 1st, Lydia Poliquin, the daughter of Fred and Vitaline (Brooks) Poliquin, on 5 Aug 1912 in Exeter, NH. He secondly marr, on 20 Oct 1926 in Stratham, NH, to Evelyn A Eastman, the dau of John and Emma (Whalen) Eastman. He worked as a crossing tender at the B and M Railroad in Exeter. The following ch seen w/ him in census recs: Edward I and Arline M with wife Lydia, and Marjorie E and Mildred M by Evelyn. II. NETTIE F YORK was born 24 Jan 1869, and died 22 July 1875 [gravestone]. She is buried in Ocean View Cemetery, Wells, Maine. III. GEORGE H YORK was born 5 Mar 1873, and died on 21 July 1875 [gravestone]. He is buried in Ocean View Cemetery, Wells. IV. HARRIET (HATTIE) F YORK, born 1 Dec 1877 [Wells VR pg 459]. She died after 1940 and is buried in Ocean View Cemetery [YCCI pg 2140]. She 1st married HOWARD LITTLEFIELD in Somersworth, NH on 29 June 1895 [NH VR]. He was born in Wells on 6 May 1873, the son of Joseph A and Elizabeth (Stewart) Littlefield, and died there on 3 Mar 1910 from pneumonia [ME VR]. He is buried in Ocean View Cemetery [YCCI pg 2140]. She secondly married PERLEY BROWN of Northwood, on 21 July 1915 in Strafford, NH [NH VR]. He was the son of Samuel and Sophia (Kenney) Brown. 1. Guy Littlefield, b. in North Berwick 9 Jan 1896 [ME vr]; died there from bronchitis on 16 Apr 1896, aged 3 mos, 7 days [ME vr]. He was buried in Ocean View Cemetery, Wells. 2. Norris B Littlefield, b. 8 Jan 1904 [SSDI] in ME; d. Feb 1974 [SSDI]. Lived with his mother, unmarried, in Northwood [1920-40 censuses], a laborer and farmer. 1850 Wells census; hh 437/478; "Harrison"